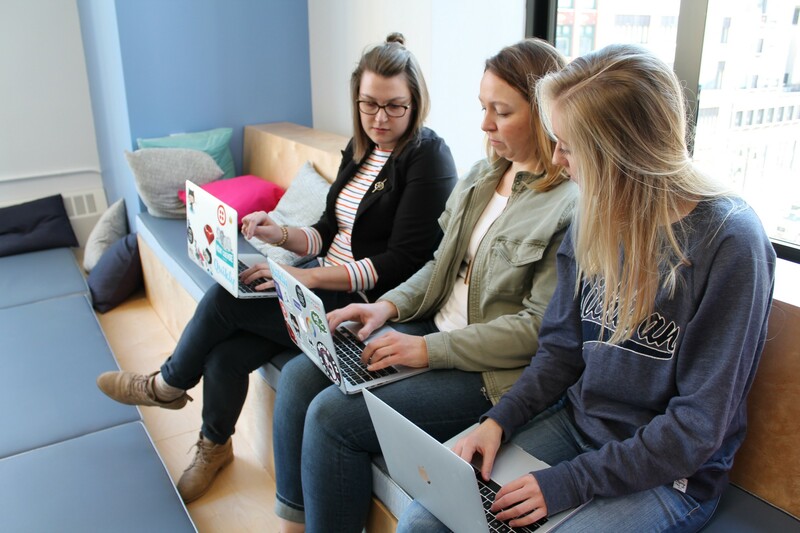 To All The Young Ladies Out There — You Actually Are Perfect For A Career in Tech and We Need You! To All The Young Ladies Out There — You Are Actually Perfect For A Career in Tech and We Need You! I love working in the technology field! But I didn’t start out even considering technology as a career. In fact, I didn’t decide on a career in software engineering until I was a junior in college. There were no computers in my house growing up. Getting a cordless phone in the house was huge. I remember the day we got a VCR. Technology was a luxury my family just couldn’t afford. It wasn’t until I got a part-time job in high school and a loan from the bank that I was able to buy my first computer. The night I brought it home the setup was overwhelming. There was no internet to find instructions, only a confusing manual that paralyzed me with fear that I would type the wrong command and the computer would implode. I couldn’t get beyond that fear to even try. You are all amazing, incredible, smart young women with a world full of potential open to you. I spent years listening to what others thought I would be good at, what I should study in college, or get a job doing. I declared my first major in college based on a comment from my high school government teacher, “Sara, you are good at math and econ. You really should look into Actuarial Science.” Done. Major declared. One year into college, I discovered becoming an actuary wasn’t for me. I realized the classes weren’t holding my interest, and while I was out socializing (i.e., at the parties), my classmates were solving calculus equations. I needed to find “my people” and took a semester of general education classes to find them. The passion I felt for technology screamed within me constantly, but I couldn’t hear it. It was drowned out by the tech stereotypes I heard all around me. Technology was a masculine profession. As a woman, I lacked technical ability and skills. It was an environment I wouldn’t want to work in. I’d heard it all. One day into “Intro To Programming”, a general education elective a friend asked me to take with him, I found where I belonged. Now nearly 20 years into my career as a software engineer, a mom, a Girls Who Code facilitator, a volunteer teacher for high school computer science classes, and leader in the community, I see so many incredible young women falling into the same traps I did. You tell me that you think computers hate you. That your family thinks you should go into nursing because you are good with people. You have apps you love on your phone but think you are not smart enough to learn how to code. I know, it’s sometimes easier to look at yourselves through a negative lens. Time to end that. You are all amazing, incredible, smart young women with a world full of potential open to you. All the skills you have and things you enjoy that make you perfect for a non-tech career are the same skills that could make you successful in technology. Love getting creative and making designs? You’d be great at creating logos and application designs. Enjoy working with others? Fantastic! Communication and working in a team is something you will do every day. And I know, you may still think you’re not cut out for coding and technology. Maybe it is because you feel that you don’t excel in math. Video games aren’t your thing. You were told it’s not for you, or like me, you didn’t grow up with a computer and are struck with fear when you have to use one. Don’t let any of it hold you back. The world of technology and coding is not what you picture it to be. It is an industry full of opportunity for you in all directions, in all fields. You would be awesome at it, and we need you and your voice! Time to set the record straight on what working in technology and code is really like. Being good at math and being good at technology… two totally separate things! I’ve been writing code for twenty years. You know how many times I’ve written code that required more than the most basic math? Zero. I love math; I studied it in college before changing my major to Information Systems. I even have a minor is Mathematics. But I don’t use any of that math as a Software Engineer. The numbers and theories have nothing to do with whether programming may be of interest for you, they were just a shared way for you to use to practice all that problem-solving logic. I use that problem solving skill each and every day. But just because that happens a lot in math doesn’t mean you aren’t building up those same logic skills in other disciplines. Thinking about all your other classes, projects you’ve worked on, games you’ve played, sports — they are all teaching you problem solving skills. Your path that built up all your problem solving logic skills is unique, but you still have those skills. That is why you should be in development and why you would excel. See yourself the way others see you. Don’t let your “nots” define you any longer. There is something about middle school and high school that makes us girls think less about ourselves. In a 2016 Girl Scout study it was noted that between elementary and high school a girl’s self esteem drops 3.5 times more than boy’s. Trying to navigate through those times and figure out who you are is super tricky. There are so many voices around you trying to get into your head and change how you think about yourself. Maybe girls who are jealous, maybe peers who don’t get your unique self. Here is a secret: no one at that age has anything figured out. And that is totally okay. You have lots of time for that. Unfortunately, a lot of us at this point in our lives don’t give ourselves the time we need to figure out who we are. And while you’re trying to figure yourself out, there are people out there actively working against you, who try to get into your head. If they can make you feel worse than they feel, they feel good. I know that makes no sense. You can’t change them, but you can change you. Build up your shield. 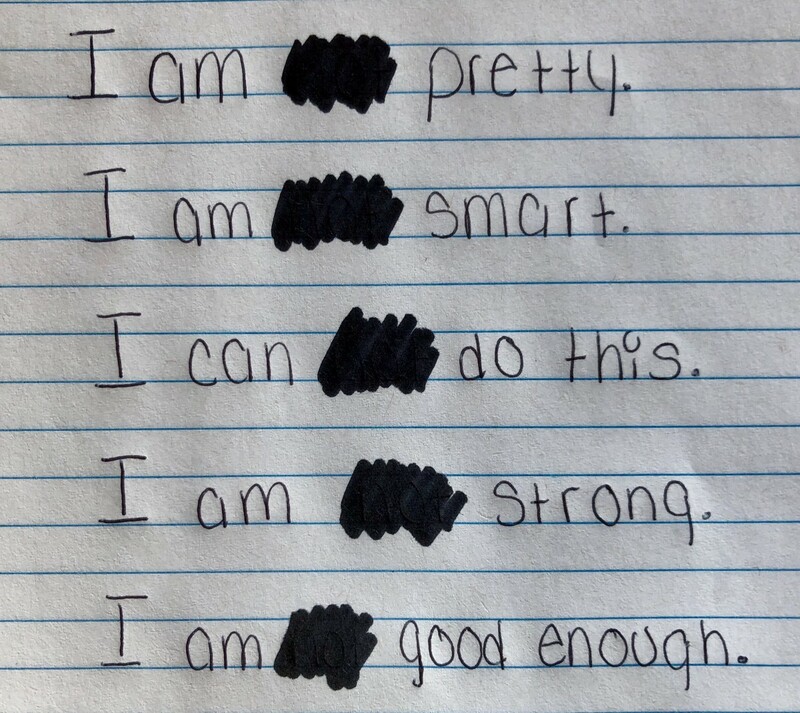 Make a list of all your “I am nots”: “I am not smart.” “I am not good with computers.” Cross out “not” on each line with a thick black marker and then read each line aloud as loud as you can. That is who you are, who you can be. These negatives you see about yourself are actually the positives those around you see in you. Reading this list aloud affirms to yourself what others are already thinking about you. Keep that list with you. Read it every day to build up your shield. The stronger your shield, the fewer outside voices will get through, and you will be free to be your true self. When those negative comments come, you will be ready. Don’t let them get through. Always see yourself in the positive light that those around you see. Have the confidence in yourself that they do. That we have in you. A love of playing video games has zero to do with being a good developer. Sure, if you like to play video games, you might like to learn how to write code. Or you might not. I love listening to music. But I have no interest in making it, nor should I ever sing in public… I mean ever. Each of us is different. An interest in video games has no impact on your ability or interest to be a programmer, just as an interest in music has no impact on your ability to sing or write music. Making video games is one small element of the programming field. Code is everywhere. Look around you. Think about your day since you woke up. Unless you are off-grid camping, you have interacted with code all day. The thermostat, alarm clock, phone, television, cable, microwave, toaster, car, camera, calculator… code has been working hard around you all day without you noticing. Maybe you love the photo filters on Snapchat and would like to create your own. It’s that creative instinct that might indicate a love of coding, because at its core, coding is a creative exercise. Maybe you are interested in taking care of animals and think code won’t help you with that dream. Take a minute to think through all that is used to care for animals, from equipment the vet uses to gadgets for the house to dispense food, water, or treats. They all have code baked into them. And if you learned to code, imagine what new technologies you could create by combining that knowledge with your desire to care for animals. The possibilities are limitless for any field. Code is not limited to video games. Your affinity for playing video games has no determination on whether you should learn to code. Check out how Imogen Heap uses code to create music. You are way smarter than you give yourself credit for. Own it. You’ll feel incredible! This year I get the privilege of helping lead an AP Computer Science class. In the first week the students went around the room talking about something each of them could teach another student. The exercise was to talk about how code can be used to help teach or improve that interest. I found it fascinating that as we went around the room, the boys all mentioned sports or subjects they felt confident in: soccer, programming Roblox, calculus, air-soft. The girls, however, went a different route: dancing, cooking, and driving a golf cart. Why was that? Sure, cooking and dancing take talent, but I knew these young ladies. They were smart and talented in multiple disciplines, but when offered the chance to share, they chose to minimize all they were capable of, a choice that offered them no challenge from their classmates. Here these ladies sat in AP Computer Science, offered only to upperclassmen in high school, but still seemed to lack the confidence to stand up and proclaim their strengths. Never feel limited by what you know or don’t know. I saw a similar scenario at our Girls Who Code club kickoff. None of the girls wanted to talk about things that they enjoyed, made them unique, or they felt they were really good at. I want to tell you the same thing I told them: you are here, you are making a choice to learn and grow. That tells me you are smart, ambitious, and have a lot to offer. Don’t let anyone convince you differently. Being ambitious is an amazing quality that not many people have. Embrace it! Don’t hold back from owning all your accomplishments and knowledge. Working in tech is all about communication and teamwork, not code. Movies like to portray folks in the tech world as lone wolves, working long hours in isolation while huddled up in a dark room. Hollywood seems to view it as a stereotypical ‘hacker life’ that is about as accurate as the portrayal of McDreamy as a world-class neurosurgeon. The reason for the stereotype in the media is that the developer reality isn’t particularly dramatic. I mean it would do nothing for the sense of impending doom of a movie if all the developers were working in a sunny open office, full of music, coffee, bagels, laughter, and people working alongside each other. Careers in technology are all about working with people, communicating, knowing how to express your ideas, and listening to others. The ability to code or how much you know about working with technology is secondary to being good at all that other stuff. Knowing the basics of coding or having some items in a portfolio that you have worked on may help you get an interview for a job, but that won’t be what gets you hired. There is only one you. No one else sees the world through your eyes. Use that unique perspective! Go “all in” on what you are passionate about, mix code into it, and imagine all that you could create. To all of you, I want you to “Dream Big!” Never feel limited by what you know or don’t know. That is all solvable stuff. You want to build a device that makes your bed every morning (yes, please do that! ), but you hold back because you don’t even know where to start. Great! Let’s solve that. The technology can always be figured out; it’s the vision and dream that are unique to you. Don’t let go of that dream and vision! The most successful people I know took their passion for coding and mixed it into other things they loved. Medicine, communication, cooking, teaching… you name it. Code is everywhere. We need you and your vision to continue innovating and evolving as an industry. Don’t let anyone discourage you from this career because of their skewed perceptions of technology. See, now you know the truth, so you can completely ignore them. If you hit a point where you get discouraged, unsupported, or stuck on what to do next to turn your vision into a reality. I believe in you. You should reach out to me, and we’ll work to get you resources and support to keep your passion alive. Don’t be afraid to fail. That is how you learn. Now you know what coding and working in the technology field is really like, but how do you get from here to there? With so many resources available it’s difficult to know where to start, so here’s just a few of my favorites. Take an hour, and try one of Code.org’s cool Hour Of Code tutorials. Girls Who Code clubs are everywhere! Checkout their locations to see whether there is one by you. CoderDojos are starting to pop up in lots of places, Look to see whether there is one close to you. Enroll in a technology class within your school. If you’re in high school and there are no classes, ask your teachers or principal how you can enroll in a community college course and get school credit. Girl Develop It has over 63 chapters nationwide and growing! Teaching beginner classes all the time. Meetup groups are an amazing way to learn about all kinds of technologies and connect with people developing and learning in your area. Ready to dive all in? Once you’ve eased into the technology pool you might get hooked and be looking to dive into the deep end. With so many resources available I filtered the list down to my top two faves for those getting started. Udemy has an incredible selection of training videos for all levels. They each have a cost, so watch for specials and coupons. Codecademy has a huge list of courses and training paths. A bunch are free, so you can learn a ton through their interactive tutorials without having to pay. Each new thing you learn is a step to the next thing, so start small and simple, and watch as you build your idea up as you learn. THAT Conference is your Summer Camp For Geeks. The only family friendly polyglot community of geeks who've set out to change the world together.